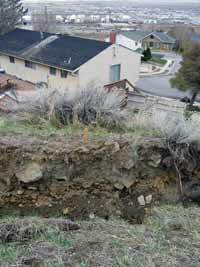 An upslope-facing scarp in the Springhill landslide in North Salt Lake. Additional damage to several of the houses on the landslide has resulted from an increase in the rate of movement in 2009.
local shallow slides on steep slopes in pre-existing landslides. Above-normal precipitation in southeastern Davis County has caused an increase in the rate of movement of the Springhill landslide in North Salt Lake, resulting in additional damage to houses, roads, and buried utilities. The landslide has moved persistently since the late 1990s, severely damaging three houses since 1998. By early 2009, the landslide was moving at a yearly rate of about 20 inches per year. 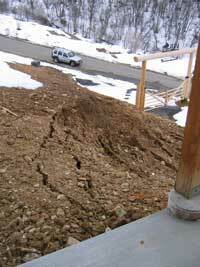 Click here for additional information on the Springhill landslide. 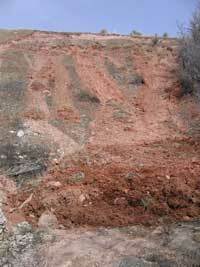 Damaging landsliding has also occurred in Ogden Valley and the Snowbasin area of eastern Weber County. Snowmelt-induced landsliding occurred in the front yard of a house in the foothills of Ogden Valley, where saturated fill soil slid onto a driveway that crossed the slope. Reactivation of pre-existing landslides crossed by State Route 226 (near Snowbasin ski resort) is causing minor damage to the highway in several locations. 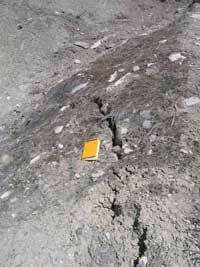 In addition, embankment failures along the edge of the highway are causing road cracks and pavement settlement. 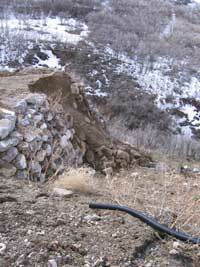 Landsliding coincident with the snowmelt was detected at several other sites this year including minor movement of the Frontier Drive landslide in Morgan County, a small landslide in a highway cut slope in Spanish Fork Canyon, Utah County and a new small slide in a local steep slope in the head of the Sage Vista Lane landslide in Cedar Hills, Utah County. Several landslides that occurred in generally south-facing slopes, including an embankment failure along US-6/89 in Spanish Fork Canyon, may have been caused by relatively rapid snowmelt. For the most part, no damage has resulted from these landslides.